Routine dental appointments are important. Regular cleanings help to keep plaque and tartar at bay; your dental hygienist is full of good advice on how to take care of your teeth at home; and frequent checkups allow your dentist to detect problems like cavities and gum disease before they become too serious. But there is another BIG reason why you shouldn’t skip regular dental visits — oral cancer. Let’s talk about why getting screened for this serious disease is so vital and how your dentist can aid in early detection. Heavy alcohol consumption. This is an especially concerning risk factor when it is combined with tobacco use. Prolonged sun exposure. The sun’s UV rays may cause melanoma to develop on the lips. A poor diet. A diet that lacks antioxidants and other vital nutrients can increase the risk of all types of cancer. A compromised immune system. Diabetes and other chronic illnesses may increase the likelihood that a person will develop cancer. The human papilloma virus (HPV). This is the most common sexually transmitted disease, and some strains of it are known to cause oral cancer. Experts recommend that all adults, regardless of whether they have any of the risk factors for oral cancer, get screened at least once a year. Detecting this disease while it is still in its early stages can greatly increase the chances of survival. If your screening pinpoints any areas of concern, the staff at your dentist’s office can help you arrange for further testing. 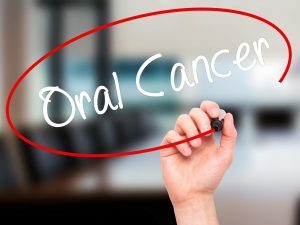 If it turns out that you do have oral cancer, you can begin exploring your treatment options with a qualified oncologist. When was the last time you got screened for oral cancer? If it has been more than a year, visit your dentist soon for a checkup. Your appointment could save your life! Dr. Erick Anderson has been practicing dentistry for nearly 25 years. Ever since he earned his dental degree from Oregon Health Sciences University, he has dedicated himself to providing patients with compassionate, high-quality care. If you would like to see Dr. Anderson for an oral cancer screening, or you have other concerns about your oral health, contact our office at 719-593-0988.